This great project combines the sparkle of rhinestone bling which is so perfect for the holidays with the soft vintage feel of ragged homespun. The result is this adorable pillow that gets me excited about the holidays every time I look at it. The bling on this project was provided by our sister site: Jubilee Rhinestones. The iron on transfer used in this project is no longer available but we have a variety of other Christmas designs. The solid red part of the pillow was made using a crushed velvet type material which the rhinestone transfer worked on perfectly. 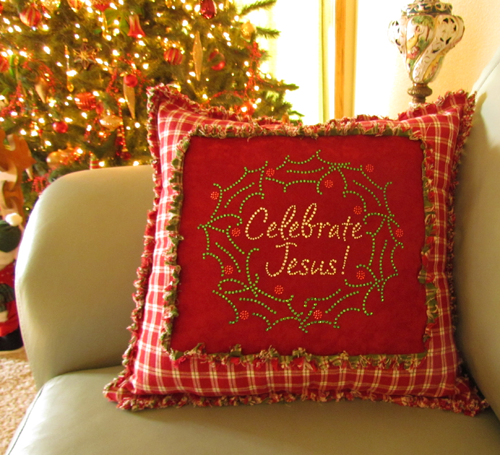 The homespun plaids that are framing the rhinestone design are beautiful red & white homespun fabric accented with an under layer of Christmas green homespun. If you decide to try this project, be sure to pre-wash your fabrics before stitching it all up. Sew the pillow together leaving a gap in the stitching so you can stuff it. Clip the exposed seam allowances according to the directions here: Clipping Seams for Rag Quilts. Then wash it all again a second time to create all the fluffy ragged fray. Iron on the rhinestones after the second wash and stuff the pillow with some Polyfil. I hope you enjoy this holiday project! It really is a quick one and we feel that it helps keep us focused on the true meaning of Christmas by filling our home with festive reminders. Have fun as you Celebrate Jesus this holiday season!